The Thai currency is the Baht. All bank notes and coins show the portrait of King Bhumibol Adulyadej or one of his beloved relatives. Visitors can bring any amount of money and every currency to Thailand. But you can only leave Thailand with an amount of foreign currency that is not higher than the amount stated by arrival. Travellers who are leaving Thailand can only take maximum 50,000 baht per person to another country. Most foreign currencies and travellers cheques can be cashed simply at hotels, tourist shops, provincial banks, shopping centers and exchange offices. Cash machines are available everywhere in the country. If you take money from a cash machine there is an extra fee of 150 baht (US $5) per transaction. To avoid additional costs you should withdraw more money as usual. Travellers cheques can be cashed best in banks, but don’t forget to take your passport with you. 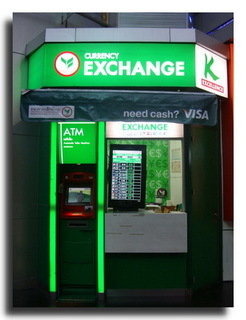 Exchange rates in banks and authorised exchange offices are better than in hotels and department stores. You can change Thai Baht to a foreign currency or purchase Thai Baht with your own currency. Hotels are always more expensive when changing money and accept only major currencies. Credit cards are accepted in Thailand. If you pay with a credit card there is maybe an extra charge of 2-3% in addition to the invoice. Don’t forget to inform your bank and credit card provider before travelling to Thailand. Your bank could block your credit card if it is used in Thailand because of security reasons. If they know that you are there everything will be fine. Tipping is not the rule in Thailand, although it is becoming more common in practice. Most restaurants and hotels charge a service fee of 10% in addition to the invoice. In restaurants Thai people leave change for tips at the table. But you can also give 20-100 Baht (maximum 10% of the invoice) for tips. Don’t tip taxi drivers, but you can leave the change in the car. Porters in hotels and parking attendants receive usually 20 baht as a tip for their service. In stores fixed prices are normal. In all other shops bargaining is OK and a price reduction of 10-40% compared to the original price is possible. The price reduction depends on your negotiating skills and the seller's mood. But don’t forget the following: Thais appreciate good manners and a good sense of humour. With patience and a wide smile you not only achieve a better price, but also have great fun and pleasure when shopping. Here is the way how to claim a VAT refund? VAT refund only applies to goods taken out of Thailand within 60 days from the date of purchase. The goods must be purchased from stores displaying the "VAT REFUND FOR TOURISTS" sign. 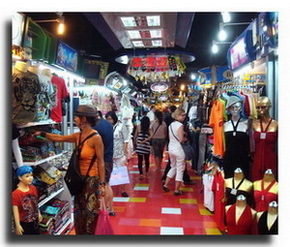 The value of goods purchased at each participating store must be at least 2,000 baht, including VAT. The total amount claimed for refund must not be less than 5,000 baht, including VAT. On the purchasing day, present your passport and ask the sales assistant at the store to complete the VAT Refund Application form and attach the original tax invoices to the form. Each application form must show a value of 2,000 Baht or more. Before departure, present your goods and submit the VAT Refund Application form and original tax invoices to the Customs officers for inspection before check-in. Valuable goods, such as jewelry, gold ornaments, watches, glasses, or pens must once more be inspected by the Revenue officers at the VAT refund office at the departure lounge after passport control. You can either present your claim to Revenue officers or drop it into the box at the Refund Counter or mail from your home back to the Revenue Department of Thailand. © Copyright 2009 - 2019, Phuket Sailing & Yacht Charter Thailand All Rights Reserved.